The Come to My Garden Windowbox sends a warm ray of sunshine straight to your special recipient's door! 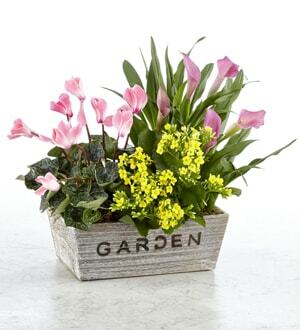 A beautiful kalanchoe plant arrives blooming with tiny yellow flowers seated in between a gorgeous a calla lily plant displaying pink fluted blooms amongst it's dark green foliage and a cyclamen plant also displaying eye-catching pink flowers, in a rectangular wooden container with the word, "Garden," displayed on the front. A wonderful Mother's Day, thank you, or thinking of you gift!